The Vista Canyon sleeps 8 in large, spacious drawing rooms. Private toilet and sink in each room. Shared shower. There is a large lounge with comfortable seating and dining area for full meal service. Windows on sides and rear of lounge provide wonderful scenic vistas from track level. Based in the Tucson/Phoenix area. 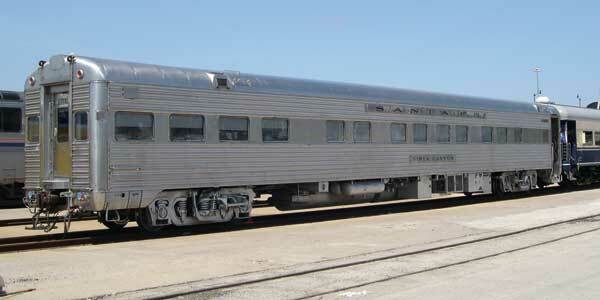 Pullman-built in 1947 for the Santa Fe’s premier train the Super Chief. Originally a 1-double bedroom, 4-drawing room lounge observation with a round end that was squared off in 1955 for mid-train service. The shower and kitchen area have replaced the original public toilet and linen locker.